CodeRED 20602 Replacement Battery for Kenwood KNB20N FREE SHIPPING! The CodeRed Replacement Battery for Kenwood KNB20N was created with premium materials to ensure a long-lasting experience. Backed with a 1-year warranty, technology enthusiasts are sure to be pleased with this option. The high-quality KNB20N aftermarket battery is outfitted with 7.2V and has a 2000 mAh capacity. From camping trips to at-home use, this product is designed to outlast its competition. It works with the following radio models: Kenwood: TK260, TK260G, TK270, TK360, TK360G, TK370, TK370G. 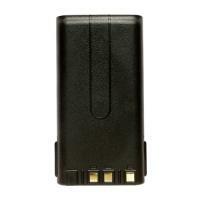 ©2002-2019 CopsPlus.com: CodeRED 20602 Replacement Battery for Kenwood KNB20N FREE SHIPPING!